Abstract base class that provides the basic interface for classes that estimate levels of background radiation in hadron and heavy-ion collider events. Definition at line 50 of file BackgroundEstimatorBase.hh. Implemented in fastjet::GridMedianBackgroundEstimator, and fastjet::JetMedianBackgroundEstimator. get sigma, the background fluctuations per unit area; must be multipled by sqrt(area) to get fluctuations for a region of a given area. 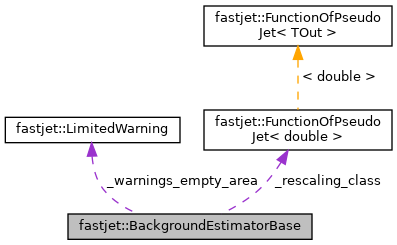 Reimplemented in fastjet::JetMedianBackgroundEstimator, and fastjet::GridMedianBackgroundEstimator. Definition at line 82 of file BackgroundEstimatorBase.hh. get rho, the background density per unit area, locally at the position of a given jet. Implemented in fastjet::JetMedianBackgroundEstimator, and fastjet::GridMedianBackgroundEstimator. Definition at line 95 of file BackgroundEstimatorBase.hh. Definition at line 116 of file BackgroundEstimatorBase.hh. Definition at line 135 of file BackgroundEstimatorBase.hh. There is currently no support for different rescaling classes for rho and rho_m determinations. Definition at line 154 of file BackgroundEstimatorBase.hh. given a quantity in a vector (e.g. If do_fj2_calculation is set to true then this performs FastJet 2.X estimation of the standard deviation, which has a spurious offset in the limit of a small number of jets. Definition at line 48 of file BackgroundEstimatorBase.cc. Definition at line 95 of file BackgroundEstimatorBase.cc.